I know, it's safe in the box. Major road; subdivision entrance; cul de sacs; gridlock. We still end up with cars getting burglarized, and the traffic is worse. But if it's not a true grid pattern, then any other road that goes through is merely a shortcut. Anyhow, we're stuck with this system over near Kernan and McCormick. Also, I'm not sure roundabouts work once a road gets to have a certain amount of traffic, so forgive me if it's all wrong, road engineer-types. Looks like Minnesota's DOT has approved roundabouts for traffic up to 80,000 vehicles per day (ADT). According to Florida DOT, we're at 29,000 on McCormick and 16,000 for Kernan. While, I'm not sure they can be added together, I'll just do that to be safe. 45,000, which means still short of the 80,000 limit. 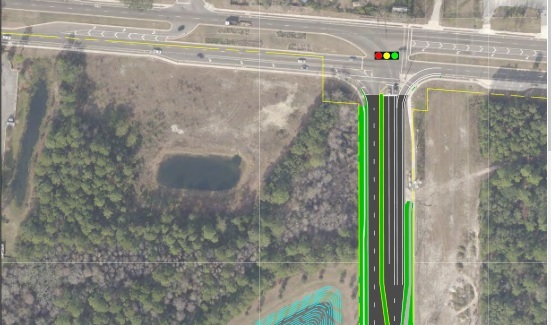 The reason why the Morse Blvd circle I saw in The Villages was unique was its bypass system. Since I don't love traffic circles in the first place, it was nice to bypass the circle, so that's the idea that I used in my redesign of McCormick at Kernan. If you are traveling westbound on McCormick, there's a bypass (like the one in The Villages). But mine takes it even further, since you can bypass the circle if you are traveling eastbound on McCormick and want to go south on Kernan. Or, you can also bypass if you're heading northbound on Kernan and want to head east on McCormick. Everyone else gets into a two-lane wide traffic circle to exit where they must. I think traffic circles are tough for pedestrians, so that's where the lights would be. I have crossings and sidewalks marked in yellow in the photo. A pedestrian hits a button, and the light turns red, then moves to flashing red. I do not know how many people venture out on foot around there, but it's worth having a way to cross, even if it's only crossing McCormick using one of the two crossings I added. Other design features include a new exit from Grace Lutheran School that becomes the right-turn only lane for east-bound McCormick, making it safer to leave the church and school. The best design feature, however, is the circle itself. A green area that can have a monument installed, like a statue of Mayor Curry that looks like the Ponce de Leon one down in St. Augustine. Or just a retention pond. Since I don't understand all the intricacies of traffic circles, I might be missing something. The flow might be too good here and gum up the works at McCormick and Monument. I am sure the lights are timed all across the city, and this would not allow timing to help flow. And there seem to be a couple of driveways on the north McCormick bypass that will be forced to go west. Still, I think it's an interesting option that (as of 2018) still has land available to make it happen (south side of McCormick). 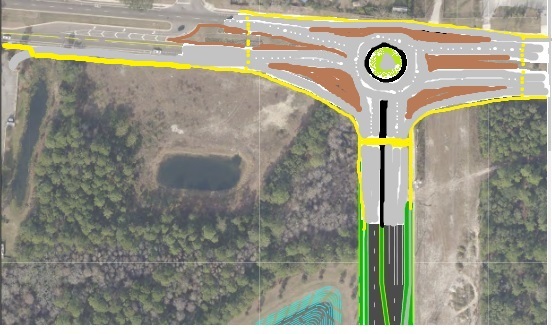 I would also like to apologize ahead of time in case someone does develop a traffic circle here and it ends up being a complete disaster. But when it doesn't happen and there's a new gas station, apartment complex, longer lights, more gridlock at the intersection, and no way left to redesign it all, at least I can say I threw an idea out there that might have helped. And, in case you were wondering. I used Paint to design this, so real engineering people could make it look a lot nicer in renderings.